I’ve been posting a fair bit of PowerShell recently for Clustered Data ONTAP. 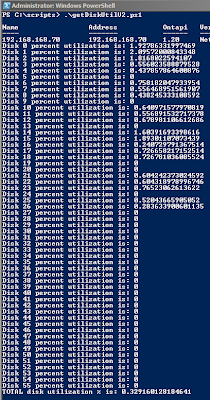 Here though, I present a PowerShell script for Data ONTAP 7-Mode (tested on an 8.2 SIM), to get the total disk percent utilization. 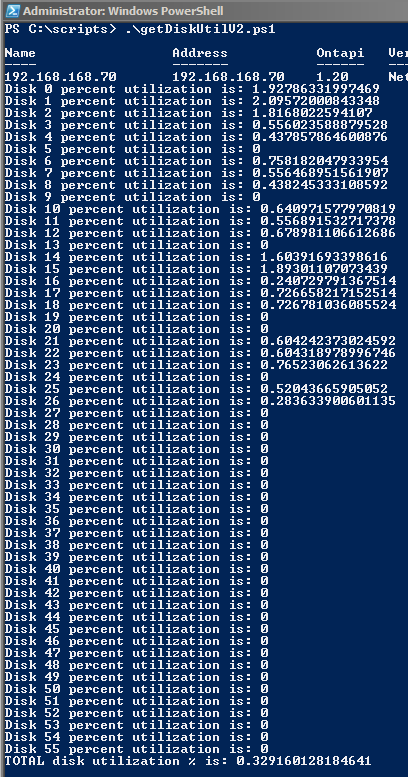 This gives - as one of the columns - a total disk utilization percent across the system. The Data ONTAP PowerShell Toolkit doesn’t have a Get-NaSysstat cmdlet (I’d love to know why), so you can’t just simply run a Get-NaSysstat to find the “Disk util”. Iobanov posted a Get-NaSysStat.ps1 here https://communities.netapp.com/docs/DOC-10354 which is far superior to the script posted below, but doesn’t quite do what I want; I want “disk util” and that’s all I want. Credits to Iobanov for pointing me in the right direction, and to a March 2010 document “NetApp Unified Storage Performance Management Using Open Interfaces”, which on page 16 explained the PERCENT counter to me, and the formula to get a percent output from the disk_busy and base_for_disk_busy counters. Note: You might want to include an interval here, between the first and second sample, but, unless your system's hyper fast, it will have taken a few seconds to get from the first disk to this point anyway! "Disk $i percent utilization is: $perDiskUtilPercent"
"TOTAL disk utilization % is: $diskUtil"